Home›Features›Queen - The 1973 Self-Titled Debut from the Classic Rock Legends! 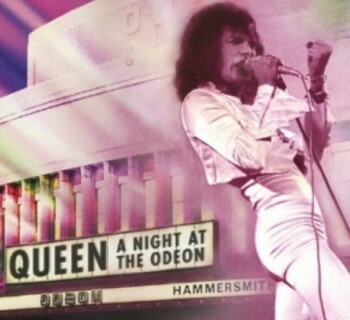 With some of classic rock’s biggest hits and a sound all their own, Queen is a band that needs no introduction. 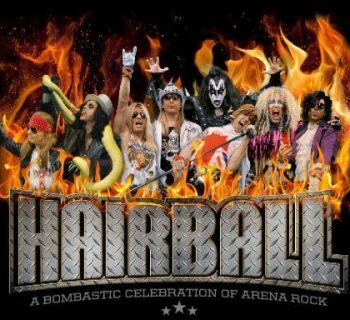 Frontman Freddie Mercury, guitarist Brian May, drummer Roger Taylor, and bassist John Deacon are some of rock’s most enduring superstars, with a legacy few other bands match. Queen were on top of the world and it seemed like nothing could stop these rock legends, right up until Freddie Mercury’s death from AIDS in November of 1991, at the age of 45. Anyone who has listened to classic rock radio has heard Queen’s hit songs. But where did it all begin for these rock legends? Queen’s first album was released in July of 1973. The band struggled for quite some time to get a record deal and suitable conditions under which to record their album; they had recorded some demos at the De Lane Lea Studios in late 1971, and eventually, began collaborating with legendary producer Roy Thomas Baker, who would helm the sessions for their next several albums as well. The album itself was finished and fully mixed before the end of 1972, but Trident Studios, where they had recorded the majority of the album’s tracks, struggled to find any company willing to release the album. Eventually, in 1973, the band released the album themselves. Queen's self-titled debut album was released in July 1973. The 1973 self-titled debut record from Queen was not nearly as commercially successful as their later, more popular records. In fact, of all the songs on the radio, only “Keep Yourself Alive” seems to get any radio play. How is the rest of this album, and should fans go back and rediscover what the band has to offer here? The record is uneven and wild in places, but even from day one, Queen’s members proved themselves to be master songwriters and performers. Shortcomings are few and far between; there is a lot of great music to be experienced here, much of which is a far cry from the band’s later, more commercial material. Of course, “Keep Yourself Alive” remains the album’s “poster child,” the only song from the debut that the masses seem to know. 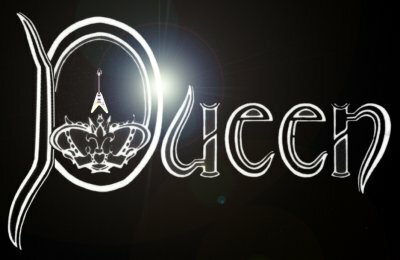 That said, it is a great straightforward rocker that deserves this reputation and a place of recognition in the vast hall of Queen hits. The rest of the album is equally satisfying, despite much of it being widely unknown and forgotten. The album speaks for itself. Mercury’s composition, “Great King Rat,” is one of my all-time favorite Queen songs, going from a riff-heavy rocker to melodic, haunting passages as only this band could deliver. “Liar” was one of the band’s first singles, and what a track it is, with plenty of musical diversity and powerful vocals. Even most of the so-called “ballads” on this album have some rock substance to them, with killer guitar playing from Brian May. “My Fairy King” is a great song that shows Mercury’s knack for writing fantasy lyrics, something that would be criminally underused on later Queen records. One of the real surprises on the album is “Jesus,” largely a low key, acoustic affair telling the tale of the eponymous messiah. And who could forget “Doing All Right,” a remake of a song from Brian May’s pre-Queen days? 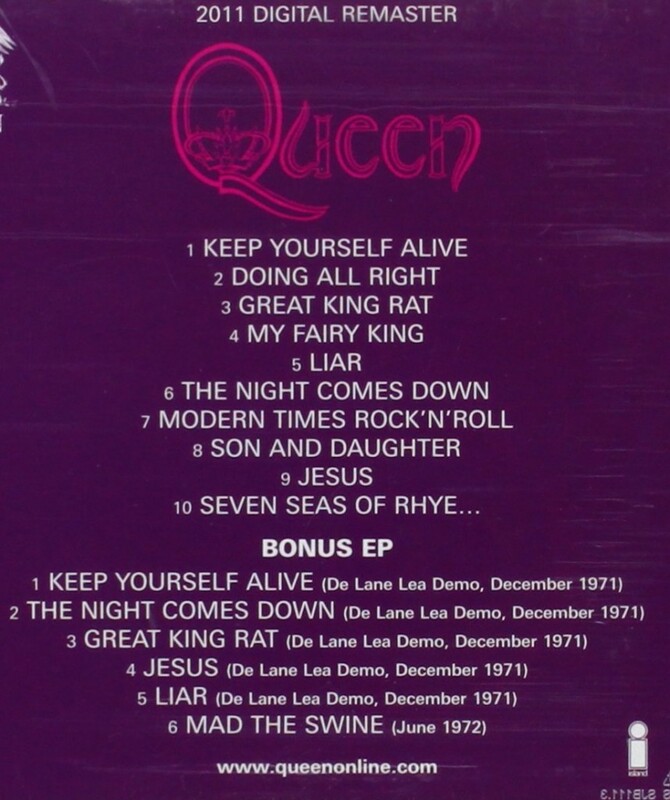 The only real shortcomings on the album are the short, instrumental version of “Seven Seas of Rhye,” which feels like a filler, especially compared to the “completed” version from Queen II released the following year. The other weakness is “Modern Times Rock N Roll,” Roger Taylor’s straight-up fast paced hard and heavy rocker, which feels half-finished clocking in at just under two minutes. Better developed, this could have been the best song on the record. Fortunately, moments of weakness are a rarity on Queen’s debut album. 2011 remastered CD features second disc, which is an EP of bonus tracks, primarily the De Lane Lea demos from December 1971. The album was reissued in 2011 with a second CD of bonus material, featuring the De Lane Lea Studios demos the band recorded in 1971, plus “Mad the Swine,” a track from the sessions that initially did not make the final record due to the band’s dissatisfaction with it. Sadly, there is a lot of blank space on the bonus disc (these songs would have fit on the first disc with the rest of the album) and this ends up feeling like a missed opportunity. Missing from the 1991 Hollywood Records remaster are the “long lost retake” of “Keep Yourself Alive” and the 1991 remix of “Liar” (though admittedly the latter, along with most of the remixes from that older remaster series, are disposable). There was just so much other material that could have been included here – alternative versions, demos, Smile and Larry Lurex tracks, BBC sessions… the list goes on. If you do not own the album already, this is definitely the version to have. But if you already bought the 1991 remaster, you are not missing much here and it really is not necessary to double dip. Queen’s first album is one of the forgotten gems in their proverbial crown, and fans owe it to themselves to add this one to their collections. With underrated tracks galore, you cannot go wrong with the band’s first album. 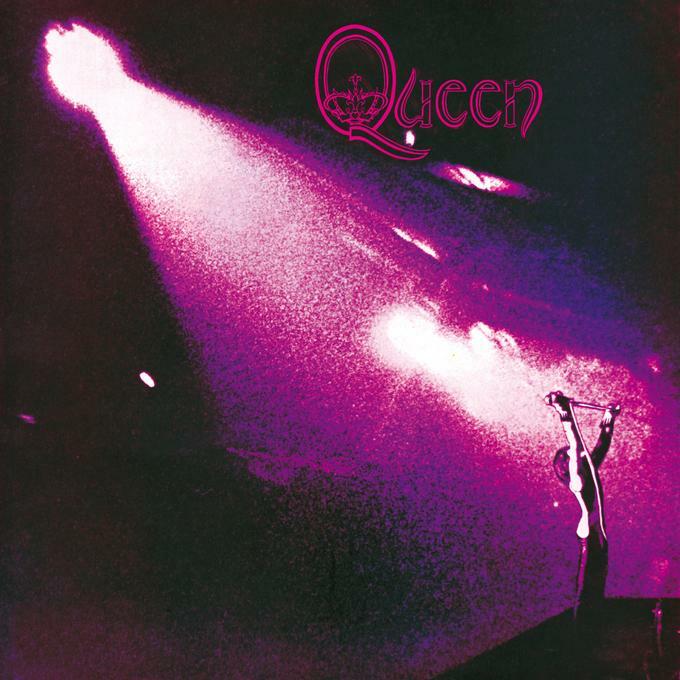 Casual fans may want to get some of the better known records and come back to the early records after giving those a listen, but those who explore the cuts on Queen’s debut are sure to be impressed. Highly recommended listening.